This weekend was hot, with temperatures maxing out at 33 degrees in Napier, brought about by warm northwesterly winds. 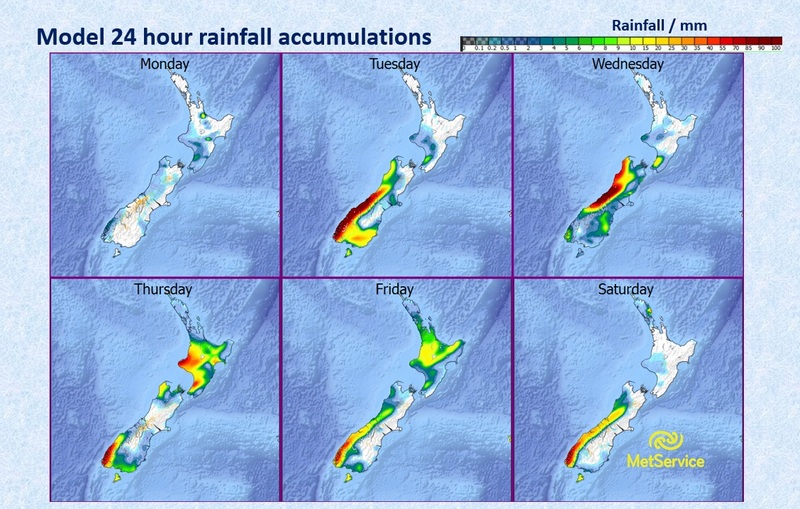 Few places saw any rain, the exception being Fiordland and the southern West Coast where Milford Sound clocked up 124mm of rain during the two days. Clear skies until evening and a cooling southwesterly breeze should make great conditions for the cricket in Auckland today, who enjoy an extra-long weekend with their Anniversary Day. Rain begins in earnest on the South Island West Coast tonight as a front moves towards the country. There is a ridge of high pressure holding firm over the North Island, which slows the progression of the rain further north on Tuesday and Wednesday. This slow motion means that as much as 180mm of rainfall could accumulate on the West Coast over the two days. Strong northwesterly winds ahead of the front will bump up temperatures in the east, but it could rise to severe gale in exposed parts of Canterbury, Otago and Marlborough later on Tuesday. In the north the ridge of high pressure stays put, and although some rain will make it to the western and lower North Island on Thursday, the front is rapidly weakening by that point. There will be strong winds in the south, especially late Tuesday and Wednesday. The chance of any significant rain in the north and east is slim, although there will be more cloud around than at the weekend. Temperatures will be maxing at around 30 degrees in the Hawkes Bay from Tuesday onwards. “This weather pattern due to occasional fronts weakening under a ridge, which is typical of New Zealand summer, is looking likely to hold into the coming Waitangi weekend” said meteorologist Tom Adams. Day-by-day rainfall accumulations, data courtesy of UK Met Office.